How can a stream only shin-deep cut a 1,000-foot deep canyon through the heart of the desert? I’m sloshing down the middle of Aravaipa Creek in southeast Arizona and feeling dwarfed by nature. A jungle-like growth of willows and alders tangles the banks, and prickly cacti stud the talus slopes. Above me, towering walls cut into the cobalt sky like twin knives. Multi-colored cliffs frame the narrow view. The mixture of black shadows, eye-ache blue skies, and subtle hues reflecting off the beige and yellow walls creates a visual scene my brain struggles to comprehend. Lost in the magic of my surroundings, I hear a piercing scream. I stop in my sodden tracks and listen. Nature abhors silence. I’m immersed in a corridor of sound. Yellow warblers and Bell’s vireos proclaim their creekside territories, the water gushes across the rocks, and the breeze rattles the cottonwood leaves. No hum of distant expressways, overhead airplanes, or human chatter interrupts nature’s soliloquy. I search the canyon walls and mountain slopes but see no signs of life. We’ve seen only two other hikers all day. We adjust our backpacks and start down the stream. Once again, a scream ricochets off the narrow canyon walls. This time we locate the source -- a tall cottonwood at the mouth of a small side stream. We don’t need binoculars to see who’s crying the alarm. A black hawk perched on a limb protests our intrusion into this idyllic setting. Black hawks, an endangered raptor that preys on frogs, are just one of the desert creatures that depends on the constant flow of Aravaipa Creek for survival. Seven species of fish, eight amphibians, 46 reptiles, and more than 200 bird species inhabit the 6,700-acre wilderness. 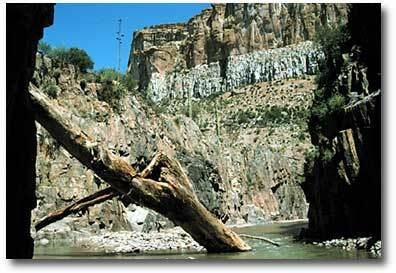 An incredible diversity of riparian and desert plants adds to the biological richness of the canyon. 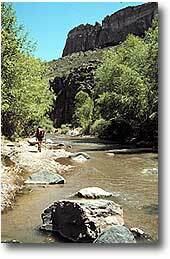 Aravaipa Creek is born of perennial springs in the 7,000-foot Galiuros Mountains. Fourteen tributaries join it in its journey to the San Pedro River. By the time the stream twists into the 11-mile canyon, its crystalline waters flow ankle to waist deep. Summer flash floods leave two-foot-thick cottonwood trunks jammed in crevices 20 feet above the stream. We began our journey at the western entrance of the canyon. For the first 100 yards, the dusty trail cut through cacti, wildflowers and thorny shrubs. Then it dead-ended abruptly at the water’s edge. We secured our backpacks and hesitantly stepped into the stream. My boots would be wet for the next three days. About six miles into the canyon, we stop and pitch our camp, ready for a rest and reprieve from our waterlogged footgear. A site on a terrace high above the creek affords a sweeping view of two cathedral-like cliffs. Across the creek, a narrow column rises 100 feet above the desert floor. An agave, or Spanish dagger, gives it a thorny crown. Through the ages, rushing water wore a hole in one side of the chimney so we dub the spot "hole-in-the-wall camp." The east-west direction of the canyon channels the rays of both morning and evening sun like a light pipe. As night falls, the alchemy of the setting sun turns the creek into a stream of gold flowing through walls of glowing stone. We climb to the crest of a high peninsula in a 180-degree bend in the creek to watch the transmutation of thorny terra firma into the ethereal. In the fading light, we see a movement high above us on the opposite slope. Something slips in and out of the shadows, but it disappears before we can focus our binoculars. Then it stops on a precipice overlooking the valley. We see the silhouette of a desert bighorn sheep. The ram seems to be watching us as ardently as we watch him. Then a ewe joins him on the viewpoint. Soon we count five adults and two lambs scampering over the rugged slopes as they forage for a bedtime snack. The magic of the canyon doesn’t end at sunset. The moon reveals another side of the grandeur of the desert mountains. After the golden glow fades from the red and white rock strata, the moonless sky turns velvet black. About an hour after we return to our camp, the moon begins its ascent in the east. The canyon comes alive with a ghostly white light. The cathedral cliffs hover in the black expanse and the castle rocks crowning the ridge top turn into majestic sentinels crowned with stars. The light line of the ascending moon inches up the cliff like a rising tide of phosphorescence, until it fills the whole canyon with a heavenly glow. The moon finally crests the mountain to our backs and illuminates the canyon like a brilliant spotlight. Once gold, the stream now turns into a silver thread flowing in and out of the shadows. We spend the next day exploring around camp and pack up the following morning. Since we don’t have a shuttle from the east end, we repeat our steps through the canyon back to our car. Saguaros watch like silent sentinels with arms outstretched to the sky as we slosh through sculpted and polished canyons. At some spots, rain and weathering have pitted the rocks to form a honeycomb of tiny niches perfect for cacti and wildflowers. Red penstemon, desert marigolds, strawberry cacti and dozens of other species create a hanging garden. Above the stream, teddy bear cholla, agaves, jojoba bushes and mesquite trees thrive on the arid slopes. 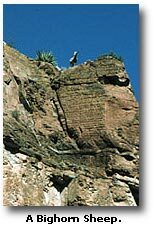 One cliff face holds hundreds of barrel cacti. The tall grass on the shore waves to the whisper of the breeze, and swallows dance in the airy space above our heads. Surrounded by nature, unaltered by human intrusion, it fills me with a soul-deep peace. This close and personal encounter with the stream, the source of life in a parched landscape, connects me with the creative force in a way that dry-boot hiking can never emulate. West entrance from Tucson: take State Highway 77 north 48 miles to Mammoth, then 8 miles farther to Aravaipa Canyon Road, turn east for 12 miles; the road is paved turning to graded, suitable for passenger cars. From Phoenix, take U.S. 60 east to Superior, south on State Highway 177 to Winkelman, south on State Highway 77 for 11 miles to Aravaipa Canyon Road. East entrance from Stafford: drive 15 miles northwest on U.S. 70 to Klondyke Road, southwest 45 miles on graded road through Klondyke to the trailhead. Five low-water crossings of Aravaipa Creek may flood, so call the BLM office for road conditions before you go. Hiking tips: In lieu of Vietnam-style jungle boots, ideal for these conditions, light hiking boots provide the ankle support necessary for backpacking. Day hikers with strong ankles do well with regular canvas shoes. Bring extra shoes or flip-flops for use in camp. All water must be filtered or purified. Camping spots are easy to find, and ground fires permitted. Camp on terraces well above the flash-flood line. Waterproof sunscreen, a hat, and other sun protection are essential. 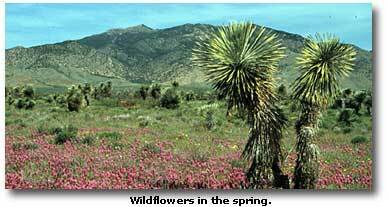 When to go: April (for wildflowers) through October; expect extremely hot days (upper 90s) from June through September. June-July rains make deadly flash floods possible. In the summer, the water stays about 10 degrees cooler than the air temperature. At the Trailhead: dirt parking lots, info board, pay station, primitive toilets. No water. Maps: A BLM pamphlet contains a detailed map and information. Two USGS topo maps cover the canyon: Brandenburg Mountain (east side) and Booger Canyon (west side), 7.5’ series. About the Author; George Miller is a writer, photographer and author of A Guide to Wildlife of Texas and the Southwest.